DanceAntonini is always seeking new talent. 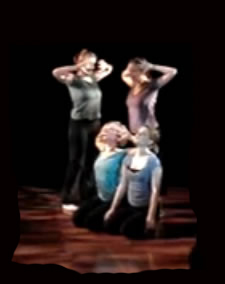 We are post-modern based and incorporate theater, improvisation, organic movement, and release technique in our works. We are looking for trained dancers and those who possess the energy and dynamic of our art. We have an eclectic blend of performers and accept dancers with a variety of backgrounds and training. Performers must be dedicated and committed to building new works and the development process. Dancers should be available to rehearse one evening every week for our projects. Rehearsal will be scheduled one weeknight a week on Monday through Thursday. Additional rehearsals for upcoming performances only are rare and will be arranged to accommodate company member’s schedules. Dancers may need to be available to perform both afternoon and evening performances for our performance projects, however, dancers are not required to participate in all performances. Performance dates will be set on our schedule for upcoming projects. One primary focus will be preparing a full evening Company Concert. Opportunities from organizational growth are offered first to company talent and dedication. We offer a flexible rehearsal schedule to accommodate dancers professional and personal needs.